Do You Need Social Media to Crowdfund Successfully? Crowdfunding sends your project out to the Universe. UHelp.com is the crowdfunding platform for community, business, entrepreneurial, social cause, scientific research, creative project and individual needs. It should ultimately reach countries around the world for financial contributions and support. Even though you have ajkii great social cause and/or a great idea you may not reach your goal without social media. You have to market your campaign on as many platforms as possible. Let’s discuss one of the most important social media platforms you must know in order to create a successful crowdfunding campaign. You guessed it, Facebook! Present you project and present yourself as a valuable source of information in your area of expertise. Donors will recognize the importance of your project and trust in its success! Get creative! There’s always a new strategy, trick, or tip that someone else may find useful. Come up with new ideas about your business, nonprofit, or organization, that have helped you succeed in your field of expertise. Other people will become interested and begin to follow your posts. After all, you must know something that other organizers do not. Pitch your project and explain why you are running a crowdfunding campaign. Since you are an expert in your field, don’t be afraid to share your secrets. It will bring you followers, donors, and all other types of supporters. Think of your Donation Page as the center of your map. You want to build as many roads, or social media platforms, as possible. This is in order to promote your project and direct traffic to the center of your map, or Donation Page. The road signs along the way are like the social media posts with which you engage your audience. Make it easy for your supporters to find and donate to your project! The more you connect with your audience through different platforms, the more legitimate your crowdfunding project will appear to your potential donors! Being social is not a one-way street. It is a dialogue. You must interact with other people, no matter what platform, and care about what they care about. If #cutepuppies are trending on Twitter, then, by gosh, incorporate cute puppies into your post! Most people don’t want to read cut-and-dry advertisements. Instead, contribute to your audience and its dialogue by empathizing with their interests. In this book, you may find further advice on communicating your organization’s brand with social media, building a targeted audience, and converting an audience into financial supporters. 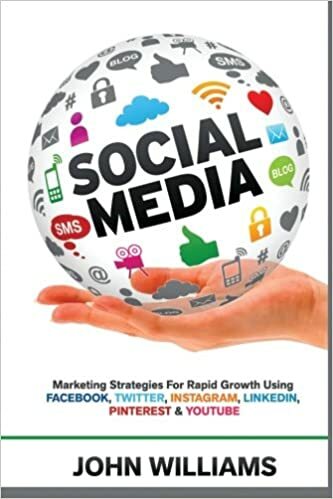 John Williams’s book, Social Media: Marketing Strategies for Rapid Growth Using: Facebook, Twitter, Instagram, LinkedIn, Pinterest and YouTube, is designed to help a wide range of organizations, from large staff sizes to small, and individual accounts. This book seeks to underline the important social media strategies of customer acquisition and conversion. Do not let social media remain an underestimated tool, find out how you can use social media platforms for your cause! While the internet has made crowdfunding more pervasive, it is nevertheless a competitive field. Social media has made crowdfunding easier in many ways, as you can express your cause and community’s need to people across the world. Once you master a few of these social media tips, you will be well on your way to successful crowdfunding! Reach out to UHelp by emailing support@UHelp.com or by calling (888) 240-1494. Very interesting info! Perfect! Just what I was searching for! “The whole point of getting things done is knowing what to leave undone.” by Lady Reading. What’s happening is I am new to this but I stumbled upon this website and found It positively useful. It has aided me out loads. I am hoping to give a contribution and aid other users. Great job. Perfectly written articles, thank you for the selective information. Thank you a lot for giving everyone an extraordinarily splendid opportunity to read critical reviews from this web site. It’s always very brilliant and also full of fun for me and my office mates to visit your website, particularly three times in one week. And definitely, we’re at all times satisfied concerning the effective tricks you give. As I site possessor I believe the content matter here is fantastic. I appreciate it for your efforts. You should keep it up forever! Best of luck.